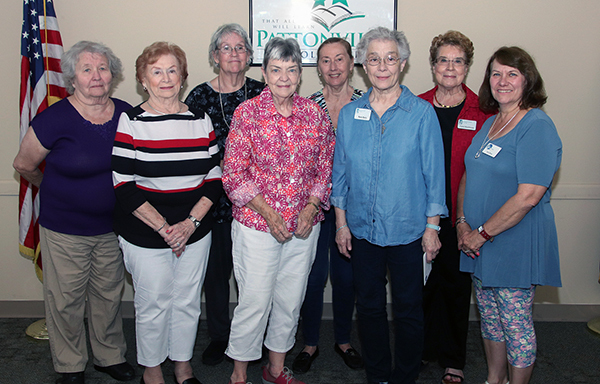 Pattonville celebrated the completion of its 27th year in the Oasis intergenerational tutoring program with a luncheon honoring its tutors on May 23. The Oasis program trains volunteer senior adults to work one-on-one with elementary-aged children on language, reading and writing skills. During the Pattonville event, tutors received special recognition for reaching milestones in their service to Pattonville children. This year Pattonville had more than 70 tutors commit to spending time each week with a student. Honored for 15 years of service was Nancy Barry. The following tutors completed 10 years of service: Judy Barnett, Margaret Dickinson, Carol Hutchinson and Marilyn Leckrone. Marking five years of service were Paula Brose, Mary Lou Burke, Ron Fitzler, Pam Marquardt, Nancy Mueller and Martha Murphy. For those interested in becoming an Oasis tutor, a free training will take place in September at the Pattonville Learning Center. For more information, contact Kelly Gordon in the Pattonville school-community relations office at (314) 213-8025 or kgordon@psdr3.org. Shown are tutors who were honored for achieving milestones of service to Pattonville children.